R.A.F. Station China Bay opened 01.08.1938 with lodger facility for RN Air Section. from August 1940. 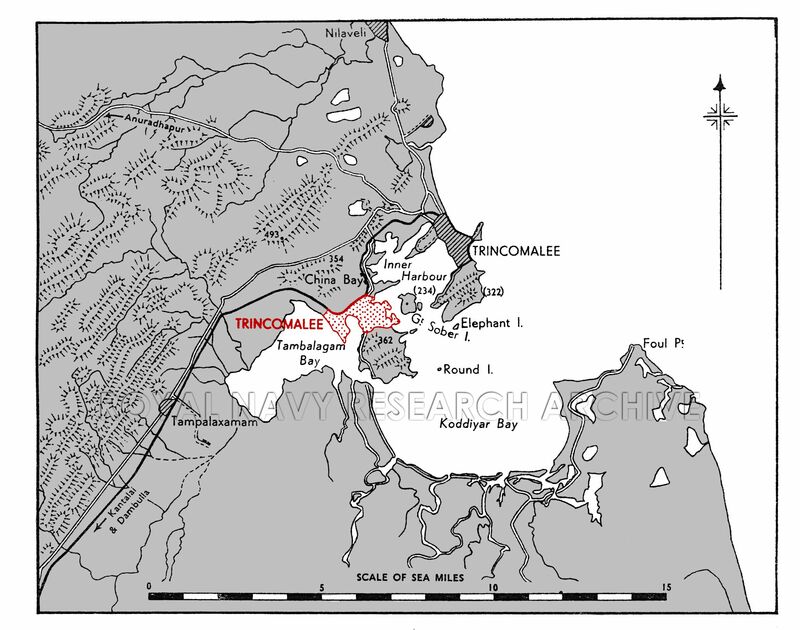 Station transferred to Admiralty 15.11.1944 and renamed RNAS Trincomalee. R.N. Aircraft Maintenance Yard (Clappenburg Bay). The R.N. Air Station is situated on the W. side of Trincomalee harbour, on the neck of the peninsula which separates the harbour from Tambalagam bay on the W.
Trincomalee, on the E. side of the harbour, lies 3 miles NE. Trincomalee harbour and the town of Trincomalee with the Naval base adjacent S.
The peninsula, on which the airfield is situated, separating Trincomalee harbour from Tambalagam bay. Great Sober Island, at the entrance to the inner harbour, lying ½ mile E. of the airfield. Main road and rail communication with China Bay and Trincomalee. The distance by road to Trincomalee is 10 miles (R). Railway stations at China Bay, distant ½ mile (R), and at Trincomalee, both on the Colombo-Trincomalee broad gauge line. At Clappenburg Bay, a pier with 15' of water alongside, fitted with a 10 ton crane, is available. One, tar macadam, with a sub-base of 6-inch broken stone on consolidated earth foundation. 06/24 QDM. 062° -242° .... 2,400 x 50 yds. 80' taxiways connect the end of the runways and give access to dispersal areas, hangars and Aircraft Maintenance Yard. "Short" type rubber buoys in Malay Cove. Two slipways each connected to a Bellman hangar, on the S. side of Malay Cove. The easterly slipway is suitable for small marine craft only, but the westerly one is capable of working large flying boats. Hill (493), distant 3 miles NW. Sober Island, 2100 yds. E. ; and (362'), 1800 yds. SE. W/T masts, zoo', moo yds. NW. of " 06 " end of runway. W/T masts (alt. 150') and (230'), 600 yds. SE. and 1400 yds. ESE. respectively of the "24" end of the runway. Normal approach is either from the NE. or SW. In both cases the approach, over water, can be made low. Two windsocks, one on S. side of airfield, one on hangar on S. side of Malay Cove. the eastern approach to the runway. 251 MS, YG & YJ. Fighter direction using G.C.I. and Interrogator. 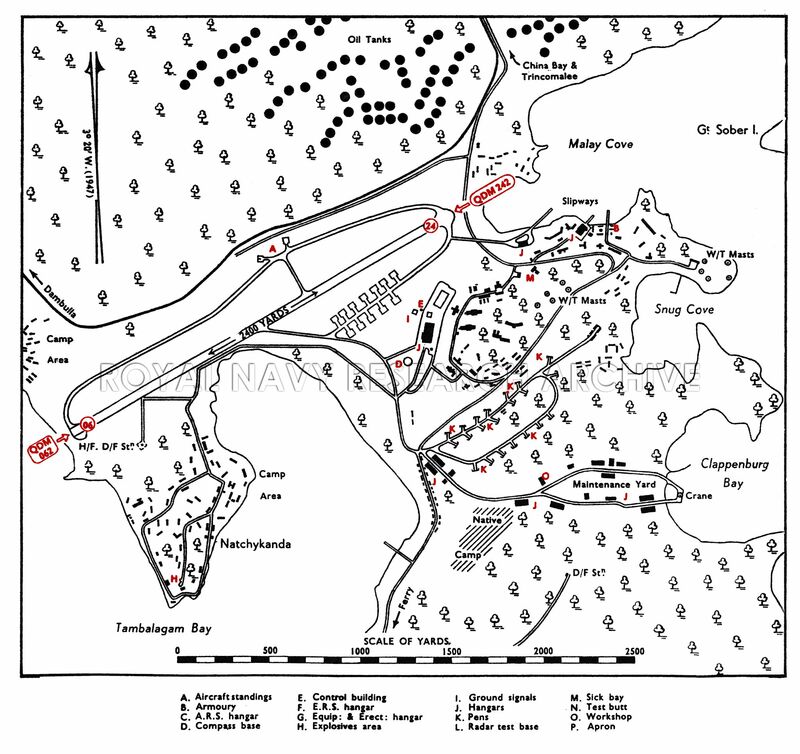 Camps at Natchykanda promontory, TambalagamBay, at Clappenburg Bay and in Headquarters buildings. There is also accommodation for W.R.N.S. Stocks to provision 8 squadrons of all types, except A/C fitted with R.P. Dispersal areas, on SE. and NW. sides of airfield, are at present being re-sited and re-modelled to suit R.N. needs [R.A.F. layout]. Existing facilities, 20 heavy A/c standings. Parking area for 200 single engined A/c. Two Bellmans, at the head of the two seaplane slipways on the S. side of Malay Cove. One large hangar on SE side of the airfield. 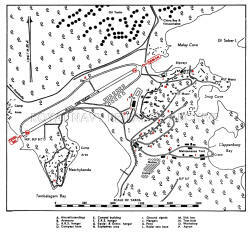 Main Sick Quarters at Clappenburg bay and in Headquarters buildings. Limited accommodation at Natchykanda Camp. Full service by Naval personnel. Weather conditions are governed primarily by the monsoons. the airfield are to a large extent governed by the strength of the monsoon ; when ‘it is strong, skies are generally overcast, cloud base is low, and rain is often heavy and persistent—especially in December and January ; when it is weak clear or partly cloudy skies are common. Cloud amount averages about 6/10 in December and January and 3/10-4/10 in February and March ; there is little diurnal variation. Rain falls on 12-16 days per month in the first two months decreasing to 3-4 days per month in February and March. April to May. Conditions are generally good apart from thundery squalls which are common in May and sometimes reach gale force. Cloud cover is similar to that during the latter half of the NE. Monsoon season, hut with a considerable increase in amount during the afternoon and evening. June to September (SW. Monsoon). Flying conditions near the airfield are generally good in June and July ; there is little rain, and cloud amount averages 5/10 in the forenoon increasing considerably in the afternoon and evening. In. August and September showers and thunderstorms occur on 4-7 days per month. October to November. Conditions are often unfavourable. Thundery squalls are common in October and rain, sometimes heavy and persistent, falls on 13-17 days in each of these months. Cloud amount, which is a maximum in the afternoon and evening averages about 6/10. Visibility in all seasons is good except when reduced by heavy rain, and sometimes in the early morning from November to January when light mists may occur. 90,00o gallons in two installations. Three further installations with a total capacity 72,000 gallons are projected. Installation with capacity of 18,000 gallons at the A/C Maintenance Yard. 9,500 gallons (including A/c. Maintenance Yard). 8,000 gallons. In addition 4,000 gallons at A/c Maintenance Yard. Test butts for M.G. and for cannon available. A double Class "B" Aircraft Repair Yard with Torpedo Workshops (later reclassified as an Aircraft Maintenance Yard) situated on the W. shore of Clappenburg Bay, about one mile SE. of the Control Building and connected to the airfield by taxi-tracks. There are 6 hangars in the Yard, types and sizes not known. Visiting A/c. park subject to change. 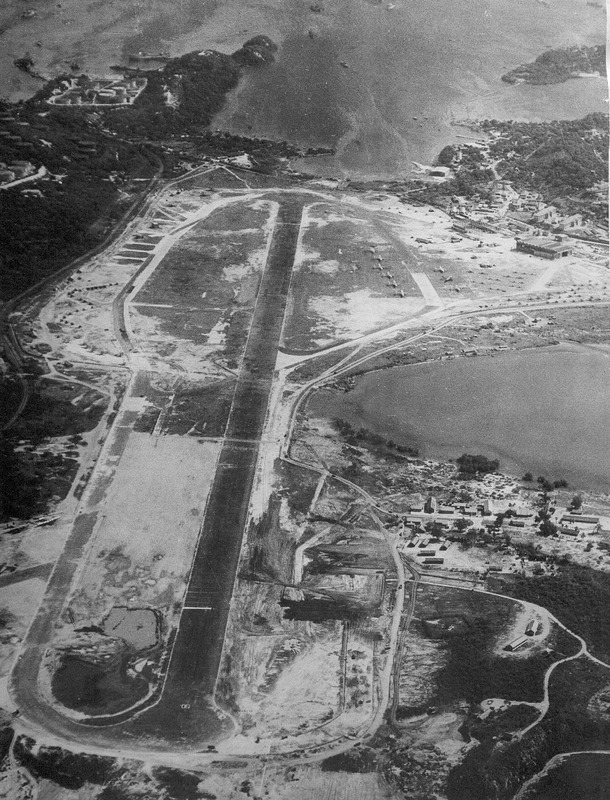 Note: Seaplane hangars and facilities in Malay Cove are in use by R.A.F. Information taken from CB 4368 B. Admiralty Handbook of Naval Air Stations Aug. 45 and B.R. 1807 Dec 48. Equipment included: Avenger, Barracuda, Beaufighter, Beaufort, Corsair, Defiant, Expeditor, Fulmar, Harvard, Martinet, Mosquito, Reliant, Seafire, Sea Otter, Swordfish, Tigermoth, Vengeance, Walrus, and Wildcat. Equipped with 6 Swordfish I. Formed here 01.11.1945. Embarked in SMITER 23.12.1945 and disembarked to RNAS Sembawang 27.12.1945. Equipped with 6 Corsair, 6 Vengeance and 1 Harvard. Moved here from RAF Koggala 26.05.1945. Absorbed into 733 squadron 03.06.1946. Equipped with Reliant, Sea Otter, Seafire, Swordfish, Tiger Moth, and Walrus. RAF China Bay is still being used as the Air Force Academy of the Sri Lanka Air Force. Area is smaller. Clappenburg is outside the Academy and the WRNS quarters now abandoned. Runway was extended slightly and very much in use. Slipways were later used to facilitate boat repairs and remembers of the racetracks leading from Malay cove and Clappenburg could still be made out by a discerning eye.